Dan Tortora provides exclusive content from his credible sources on Syracuse basketball and football as well as the collegiate and professional sports' world. Tortora also offers in-depth analysis of games/teams going into match-ups, during, and after the match-ups have completed. You will see content on Syracuse University, the Atlantic Coast Conference, NCAA, NFL, NBA, & more! Enjoy & thank you for your support! Syracuse went into the break 9-for-17 from beyond the arc (52.9%). Baylor took one more and made one more than Syracuse, going 10-for-18 (55.6%) from long range in the first half. Sophomore guard Mario Kegler of the Bears began the game with two deep shots to give Baylor the first advantage of the contest, ahead 6-0. A three by freshman guard Jared Butler at the 16:34 mark of the first half moved the Bears ahead of the Orange by eight, 12-4. Butler's pass to senior guard King McClure at the 15:48 mark would end with a three by McClure to move Baylor to a 15-4 lead, Baylor's largest lead of the first half. Four players had made at least one three-point attempt at the time of the Bears' 15-4 advantage, with Kegler making two, Butler with one, McClure with one, and senior guard Makai Mason wtih one as well. But a little over three minutes later, at the 12:23 mark of the first half, a three by Syracuse junior shooting guard Tyus Battle had the Orange within one possession, down 18-16. Battle's deep shot came on a 12-3 run by Syracuse. The Orange would take their first lead of the game at the 6:53 mark when Battle completed a four-point play, knocking down a three and the subsequent free throw, to go ahead 27-25. Syracuse's largest lead of the first half would be four points, 31-27, when redshirt-junior guard/forward Elijah Hughes connected from long range. Baylor, however, would retake the lead off of a three by Mason that made it 33-32 in favor of the Bears with 2:45 to play before half. Hughes would tie the contest for the Orange at 35 apiece on a three at the 1:54 mark, but the Bears would gain the lead back thanks to a deep shot by Mason immediately following Hughes' deep make. Baylor led 38-37 at the break. At the break, five players had made at least one shot from beyond the arc for the Bears: Mason was 4-for-6, Kegler 2-for-2, Butler 2-for-5, junior guard Devonte Bandoo off the bench was 1-for-1, and McClure was 1-for-4. Syracuse's three-point makes in the first half came from three players: Hughes went 5-for-8, Battle 2-for-3, and sophomore forward Oshae Brissett was 2-for-4. The Orange and the Bears opened the second half with nine lead changes in less than six minutes (nine by the 14:20 mark), including a string of six-straight made field goals between the two teams, each squad with three from the 17:02 mark to 15:28 remaining in the second half. Less than a minute after Syracuse took a 53-50 lead, Bandoo tied the game for Baylor on a three. Including this tie, there would be three ties between the 12:!1 mark and 9:47 remaining in the game. The Orange would fail to box out sophomore guard Mark Vital who get an offensive rebound in the lane and a putback to give the Bears a 62-57 advantage. From the 9:47 mark to 4:58 left in the game, Syracuse did not connect on a single field goal, going almost five minutes without a make from the field. With 4:35 remaining, Hughes got to 23 points, a new single-game career high. He connected from long range and followed with three made free throws after being fouled trying to knock down another three, bringing the Orange from down 68-59 to a one-possession game, 68-65. He would leave the charity stripe after attaining his 24th point of the night. Mason, who had 16 points in the first half, came inside the arc with no one boxing him out on the Syracuse defense, got his rebound off of a missed three, and nailed a jumper for his first points of the second half, to move Baylor ahead 72-67 with 2:43 remaining. A foul by Battle would send Mason to the line with about a minute left and Mason would go 2-for-2, giving him 20 points overall, and giving the Bears a 74-67 advantage. Senior center Paschal Chukwu would make both of his free throws right after to bring the Orange within five, 74-69, but the Orange would fall victim to not having anyone back in the full-court press and Butler would send the long ball down-court to junior forward Freddie Gillespie for a dunk that elevated the Bears to a 76-69 lead. Mason, fittingly, would score the final points of the contest by either side, making two free throws to secure the win for 9th-seeded Baylor over 8th-seeded Syracuse, 78-69. He would finish with 22 points in the game. The Bears would finish the match-up on a 10-4 run en route to moving on to the Round of 32 inside the NCAA Tournament to face the 1st-seeded Gonzaga Bulldogs. Eight of the nine Baylor players that had minutes in this game scored: Mason with the aforementioned 22 followed by Butler with 14, Kegler with 13, and McClure with nine for the starters. Off of the Baylor bench, Gillespie had eight, Bandoo with six, and freshman guard Matthew Mayer had two. Baylor was 12-for-18 inside the arc in the game (67%) and 16-for-34 from three-point range (52.2%). 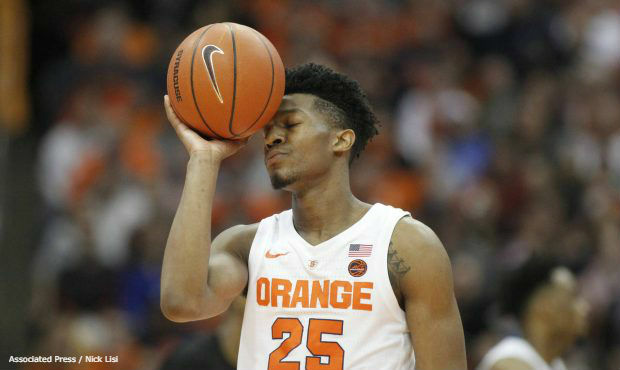 The Orange, with starting point guard and senior Frank Howard suspended for the game, played seven, with Hughes leading the team with 25 points, going 6-for-11 from long range, followed by Battle with 16, Brissett with 14, Chukwu with seven, and true freshman shooting guard Buddy Boeheim with two for the starters. Sophomore forward Marek Dolezaj had five points off the bench, while true freshman point guard Jalen Carey did not attempt a single field goal. Syracuse was 9-for-22 from inside the arc (41%) on the night, and 12-for-29 from beyond the arc (57.9%). The Orange end the 2018-19 season with a 20-14 record. In Round 3 of the Syracuse Orange - Duke Blue Devils series this season, the Orange got on the board first, with senior point guard Frank Howard connecting from long range to put his team ahead 3-0. Howard was coming off of a game the night before, in Round 2 of the Atlantic Coast Conference (ACC) Tournament, where his offensive touch came back to the tune of 18 points. True freshman forward Zion Williamson would respond with a layup and a dunk to give the Blue Devils their first lead of the macth-up, at 4-3. Howard would take it back with a layup of his own that brought the score to 7-6 Syracuse. But after their 9-6 lead that came off of a layup by sophomore forward Oshae Brissett, Syracuse would go quiet offensively. After slamming down the rock on the previous possession, Williamson was left open beyond the arc and cashed in from deep, showing the depth of his range on the floor, giving Duke a 17-11 lead. Duke would go on a 17-2 run from down 9-6 to up 23-11. In that time, Williamson would score 11 points. Williamson would take a breather at the 9:27 mark of the first half, already having 15 points, making all seven of his field-goal attempts, while accumulating five rebounds, four steals, one assist, and one turnover. With under 5:30 before the half, Williamson had 16 points himself, while the Orange had 15 points in total, as a team. Howard would go on a run himself, making four consecutive jumpers, two from inside the arc and two from the outside, for a total of 10 points. Overall, it was a 10-2 run by Syracuse, with Williamson getting a putback in the midst of it. True freshman shooting guard would add to the run with his first points of the game, his own make from long distance. Syracuse would end the opening half on a 13-2 run that would get them within two possessions, down six at 34-28, heading into the locker room. The Orange were down by as many as 17 in the first half. Williamson had 21 of Duke's 34 first-half points, while Howard accounted for 15 of Syracuse's 28 points in the opening half in the absence of junior shooting guard Tyus Battle for the second game in a row. Senior center Paschal Chukwu would get the first points for either side in the second half, when he went 1-for-2 at the line after being fouled attempting to finish an alley-oop attempt. But Chukwu would pick up his fourth foul with 18:16 remaining in the game, placing him one away from going out for the game. Howard achieved his first points of the contest on a jumper before the 16-minute mark, giving him 17 in total at the time. Less than five minutes into the second half, Syracuse had cut their deficit down to five points on three separate occasions. Brissett would make a free throw then cash in at the rim, followed by a layup by Howard, and then back-to-back three-pointers by true freshman shooting guard Buddy Boeheim to tie the game at 46 for a Syracuse team that was once down by as many as 17. With two free throws before the 10-minute mark of the second half, Howard rose to and passed 20 points, at 21. From when Syracuse tied the game at 46, Duke doubled Syracuse's points, going on a 14-7 run to the nine-minute mark of the contest, moving out to a 60-53 lead. At the 6:24 mark of the second half, Chukwu fouled out, committing his fifth foul after losing possession for the Orange on their end of the floor. He had three points and two rebounds. Syracuse, with 6:08 to play, was back down by double-digits, at 65-55. Brissett would knock down a three, followed by redshirt-junior guard/forward Elijah Hughes going 2-for-2 at the line to cut the Orange deficit to seven, at 67-60, with a little over five minutes to play. Overall, the Blue Devils would out-score the Orange 38 to 26 after the tie at 46 apiece to win Round 3 of their season bout, 84-72. Williamson would end the game leading all players on either side with 29 points for Duke, but Howard of Syracuse was right behind him with 28. The loss moves Syracuse to 20-13 on the season, while Duke elevates to 27-5, and will advance to the ACC Tournament Semifinals to face longtime rival, the North Carolina Tar Heels, who got past the Louisville Cardinals in the tournament's quarterfinals. The Syracuse Orange, still looking for their 20th win of the season, would head into their first game inside this year's Atlantic Coast Conference (ACC) Tournament without junior shooting guard Tyus Battle, their leading scorer, who accounts for almost 20 points a game at 17.2 on average. Senior point guard Frank Howard, who has been quiet offensively this season, began the game with two early three-pointers against longtime rival, the Pittsburgh Panthers. The first lead for Syracuse would come when true freshman shooting guard Buddy Boeheim, who started in place of Battle, stole the ball from fellow true freshman guard Xavier Johnson, gained control, and took it himself for a fast-break bucket that would bring the score to 8-7 Orange. Pittsburgh took the lead back immediately on a three by senior guard/forwardJared Wilson-Frame, assisted by Xavier Johnson, to bring the score to 10-8 Panthers. Stiff-arming his defender, senior center Paschal Chukwu would come out of the game as sophomore center Bourama Sidibe would cehck in to fill the open shot at the 15:21 mark. Redshirt-junior guard/forward Elijah Hughes, who did not score a single point in 11 minutes played in the regular-season finale, a road loss to the Clemson Tigers, knocked down a three before the 11-minute mark to bring the Orange deficit to four, 17-13. Chukwu would chase down the offensive rebound but would throw to the right of Buddy Boeheimm leading to a steal and slam by Xavier Johnson that extended Pittsburgh out to a 19-13 lead. Buddy Boeheim would cash in when the bank was open and the ball bounced in off of the glass to bring the Orange deficit to three, at 19-16, with 8:31 to play before halftime. But Pittsburgh would double Syracuse points on a 14-7 run to get out to their first double-digit lead of the game, at 33-23, with 4:38 to play in the opening half. True freshman point guard Jalen Carey, who came in at the 6:49 mark after playing minimal minutes this season, went coast-to-coast after a miss by the Panthers, scoring at the rim with his right hand to bring the Orange within two possessions, 33-27. 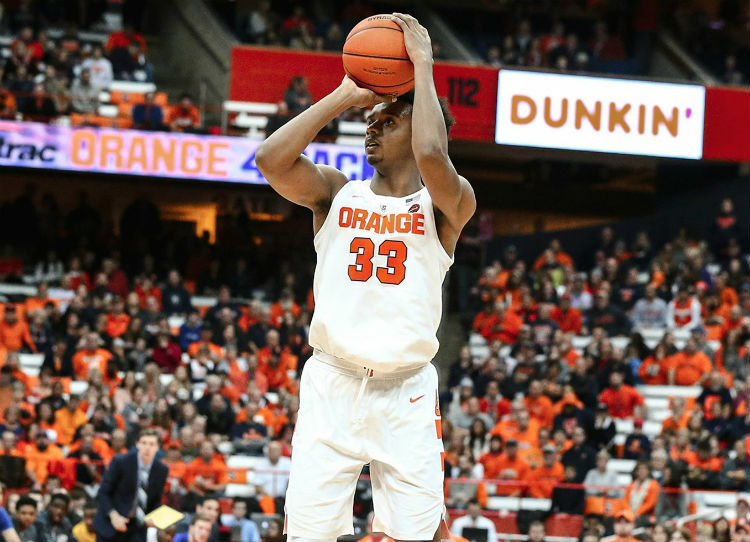 Hughes would connect on his second deep ball of the game on the very next Syracuse possession, turning what was a double-digit deficit into a three-point game, 33-30 Pittsburgh. The Panthers, as they did all half, would have an answer, as Wilson-Frame made his sixth three-pointer of the first half, sending Pittsburgh into the break with a 36-30 advantage on Syracuse. Wilson-Frame was 6-for-9 from the field in the first half, all three-point attempts. Syracuse came out with a strong offensive and defensive start to the second half, with Hughes scoring on the move on a jumper on the team's first possession of the half, followed by a block by Chukwu at the other end, and a zip pass from Howard to Hughes that Hughes used to knock down his fourth deep shot of the contest. Buddy Boeheim would get involced on the outside as well, making back-to-back three-pointers to bring the Orange from down two to ahead four, at 43-39. Boeheim's first of these two deep shots gave Syracuse their first lead since 8-7 in the first half. Syracuse was without the lead from the 16:11 mark of the first half to the 17:18 mark of the second half, a span of 18 minutes and 53 seconds. A jumper by redshirt-junior guard Malik Ellison followed by a turnover by Boeheim that resulted in a dunk by Xacier Johnson would tie the game at 43 apiece. Immediately following the tie, Hughes would connect on his fifth deep ball of the game to give the Orange a 46-43 lead. Shortly after, Howard would make his third shot from beyond the arc in the contest to move Syracuse out to a two-possession lead, at 49-43. Hughes would try for another three and miss, but Boeheim would get underneath to grab the offensive rebound. He would rebound his own miss while getting banged around, and go up again, making the basket and the free throw that went with it to give the Orange a 52-43 advantage, on a 9-0 run. Syracuse got out to their first double-digit lead of the contest when Chukwu got an offensive rebound that ended with the ball bouncing inside the nylon. Chukwu made the old-fashioned three-point play, placing the Orange ahead 57-46. With under eight minutes to play, Chukwu had seven points, eight rebounds, and six blocks, with a rebound-point tandem coming off of his positioning on a miss by Boeheim that gave Syracuse a 60-51 lead. Sophomore forward Marek Dolezaj would feed Howard, who connected on his fourth three-point basket of the game, giving him 14 points and the Orange a 64-51 advantage at the 3:54 mark of the second half. Less than a minute later, Dolezaj would make his own jumper, moving the Orange out to a 66-52 lead. Chukwu would foul out of the game on the defensive end with 1:30 to play, ending the night with seven points, nine rebounds, and six blocks. He was 3-for-3 from the charity stripe. In the absence of Battle, Boeheim finished with 20 points, Hughes and Howard with 18. Buddy Boeheim secured a new single-game career-high, with those 20 points in this contest. With a 73-59 finish, Syracuse obtains their 20th win of the season, moving to 20-12 and 11-8 in ACC games. The Orange out-scored the Panthers 43 to 23 in the second half to go from down six at the half to a 14-point advantage when the final buzzer rang. This Round 2 victory inside the ACC Tournament advances the Orange to a meeting with the Blue Devils of Duke in the Quarterfinals. This will be the third meeting of this season between Syracuse and Duke. They split their regular-season series 1-1, with the Orange defeating the Blue Devils on the road and the Blue Devils returning the favor. Syracuse's most notable win over Virginia came back in 2016 when Syracuse were down by double-figues and came all the way back to defeat then 1-seeded Virginia in Chicago, Illinois, in the Elite Eight for the right to advance to the Final Four in Houston, Texas. Celebrating his "Senior Night", senior center Paschal Chukwu slammed home two buckets before the halfway point of the first half to go with his two free throws that began the scoring for either side in the game that had placed the Orange up 2-0. From ahead 3-2 to up 19-17, the Cavaliers had a span where the only field goals they made were from beyond the arc, with junior guard Ty Jerome accounting for three of them, junior guard Kyle Guy had two, and redshirt-sophomore guard De'Andre Hunter with one. Before the nine-minute mark of the first half, there were nine lead changes in the game. True freshman shooting guard Buddy Boeheim entered the game at the 10:33 mark, and a couple minutes into his time on the court, he nailed a three to give the Orange a 22-21 lead, the 10th lead change of the first half. Buddy Boeheim would cash in with a one-hander in the lane and a three to follow, giving Syracuse a 31-25 advantage inside five minutes before half, and giving Boeheim eight points since coming in at the 10:33 mark. He came out of the game at the 2:53 mark, after playing almost a full eight minutes where he attained his aforementioned eight points. The Cavaliers would go on a 7-0 run from there to regain the lead at 32-31, off of yet another three by Guy, his third of the game in four tries. 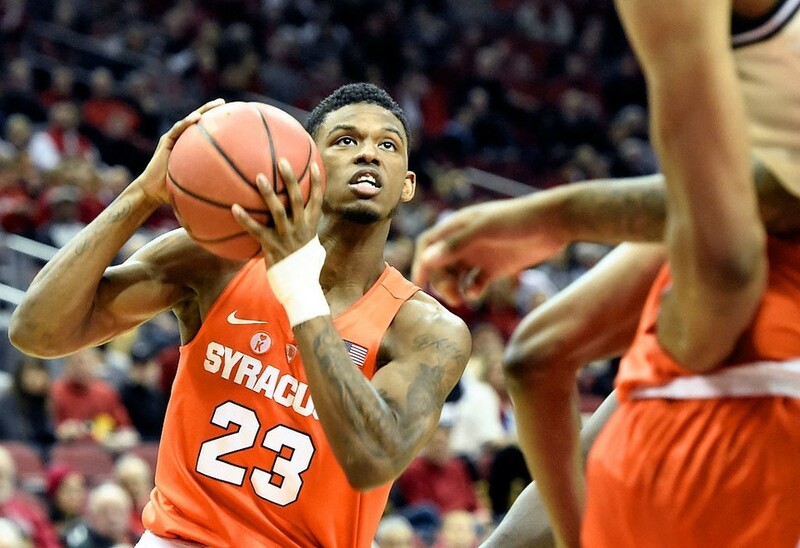 But senior point guard Frank Howard would make his own deep ball in response as the last field goal in the first half by either side, giving Syracuse the lead at 34-32 going into the locker rooms. In total, there were 14 lead changes in the first half, seven in favor of the Cavaliers and the other seven in favor of the Orange. Syracuse took little time to score in the second half, opening it up with a score by sophomore forward Oshae Brissett on the first possession. This bucket matched Brissett's entire total of the first half, which was two points. Guy would make his fourth three-pointer of the game to give Virginia the lead back, at 37-36, but redshirt-junior guard/forward Elijah Hughes would answer with a tough take to the rim to get Syracuse back ahead, 38-37. Boeheim was the first off the bench for the Orange in the second half, checking in by the 17-minute mark with Howard going out. After a three by Battle, the Cavaliers would go on an 11-0 run that would bring them from down one to ahead by double-digits, up 10, 53-43, with under 10:30 to play. Boeheim would break the 11-0 run with a three in the corner, the first field goal for the Orange in over five minutes (from 15:11 to the 9:44 mark), to bring the score to 53-46 Cavaliers. Syracuse, however, would go on yet another scoring drought right after, this of over four minutes (from 9:44 to the 5:06 mark) between Boeheim's three at the 9:44 mark and Hughes deep shot at 5:06. But at this time, the Cavaliers were ahead by 20, 69-49, having gone on a 37-15 run in the second half at this point. The Orange would go 8-for-25 (32%) from three-point range, while the Cavaliers would finish 18-for-25 (72%). Virginia would out-score Syracuse 47 to 19 in the second half en route to a 79-53 victory. Guy led all scorers on either side with 25, going 8-for-10 from the field, all from beyond the arc. Hunter followed with 21, going 5-for-7 from deep and Jerome with 16, going 5-for-6 from three-point range. As a trio, they combined to go 18-for-23 from distance. Battle and Hughes each led the Orange with 11 apiece. Syracuse seniors Chukwu and Howard finished with eight and six, respectively. The Cavaliers keep control of the all-time record over the Orange at 7-5. 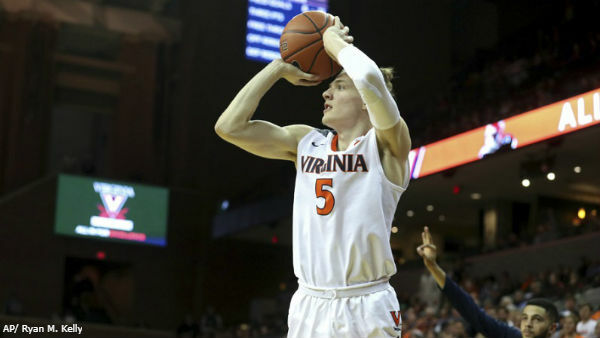 With the win, Virginia also improves to 27-2 overall and 15-2 in the Atlantic Coast Conference (ACC), with their only two losses coming against the Duke Blue Devils in-conference. Syracuse will move to 19-11 overall and 10-7 in ACC play. So far, Mack has amounted an 18-8 record overall and a 9-4 record inside the Atlantic Coast Conference (ACC) along with a Top-25 national ranking in his first season with the Cardinals. Syracuse, unranked, would be the team at the top most of the first half, however, leading for 15 minutes and 36 seconds of the 20-minute game clock. Louisville, despite having five players who are 30% or better from beyond the arc this season, went 1-for-13 in the first half from long range, a mere 7.7%, and Syracuse would take a double-digit lead into the halftime locker room, ahead by 12, 35-23. Orange sophomore forward Oshae Brissett was the lone player on either side to accumulate double-figures in points in the half, getting as many as the difference in the game between the two teams, 12 points. Sophomore forward Jordan Nwora would lead the Cardinals at the half with nine. Both squads were close at the break in second-chance points, Louisville with eight and Syracuse with nine, the Cardinals with seven offensive boards and the Orange with six in the first 20 minutes of play. The Cardinals would strike first in the second half, with two free throws from redshirt-junior forward Dwayne Sutton followed by a steal and dunk by graduate guard Khwan Fore. Brissett would get the first points of the second half for the Orange, scoring on a layup to go up by double-digits once again, 37-27, at the 17:28 mark. Redshirt-junior guard/forward Elijah Hughes would knock down two deep shots, followed shortly after by two three-pointers by true freshman shooting guard Buddy Boeheim, and then Hughes would connect again to give Syracuse five three-pointers in a span of six minutes and eight seconds (13:40 mark to the 7:32 mark). Syracuse would advance out to a 56-38 advantage with 7:32 remaining. Brissett's make at the rim with 6:25 to go would elevate the Orange to a 20-point lead, 58-38. 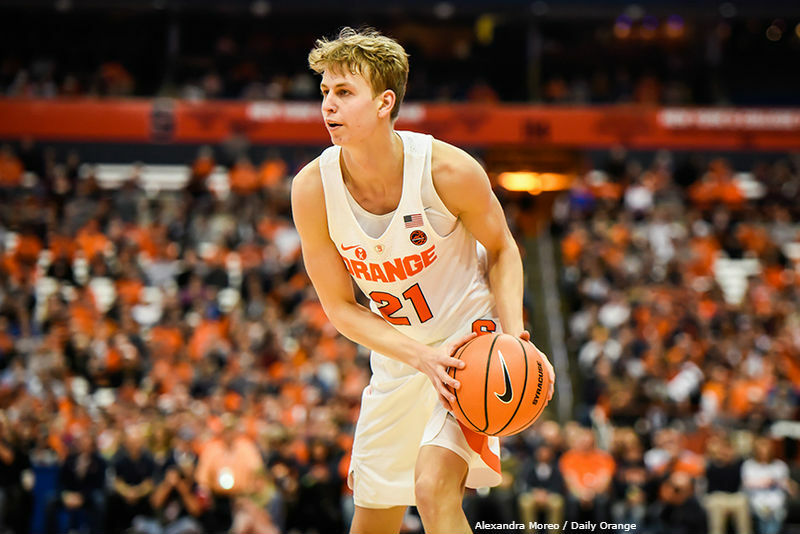 Playing with four fouls, sophomore forward Marek Dolezaj went in between two defenders and rose for a finger-roll at the rim and completed the old-fashioned three-point play with the following free throw to provide Syracuse with a 62-41 advantage. Boeheim would connect on his fourth three of the game, and third of the second half, with 1:39 to play. After Hughes' two free throws at the 1:15 mark that gave the Orange a 67-43 lead, head coach Jim Boeheim would bring on the walk-ons as well as scholarshipped true freshman forward Robert Braswell to finish the contest. Braswell would score the final points for Syracuse at the rim with 21 seconds to go, and the Orange would roll over the Cardinals with a 20-point victory, 69-49. This win gives Syracuse another signature win over a Top-25 nationally-ranked team and moves the Orange to an 18-8 overall record and a 9-4 in-conference record. Louisville dropped to 18-9 overall and 9-5 in the ACC. The Orange would have four players finish in double-figures, Hughes with 18 with all of his field goals coming from three-point range, followed by Brissett with 16 on 7-for-15 shooting, Boeheim with 14, going 5-for-10 from the field overall and 4-for-9 from beyond the arc, and junior shooting guard Tyus Battle amounting 11. Of the eight players who were on the court for at least 10 minutes in this game, only one Cardinal scored in double-digits, that being Nwora, with 11. Syracuse only allowed Nwora two points in the second half. Ky Bowman came off the bench and connected on back-to-back jumpers, the second from beyond the arc, giving Boston College the lead back, at 8-7. But redshirt-junior guard/forward Elijah Hughes answered right back with a three of his own, grabbing the advantage back immediately, at 10-8 Syracuse. Battle would rattle one home shortly after, giving him six of the first 12 points scored by the Orange, ahead 12-8. The Eagles would fight their way to a tie at 12-12, with junior forward Nik Popvic accounting for both buckets. Sophomore forward Marek Dolezaj's layup would break the tie, but senior guard Jordan Chatman would tie and take the lead with three free throws after getting fouled beyond the arc, taking the lead at the 7:22 mark, at 17-16. True freshman shooting guard Buddy Boeheim would take the lead back on the very next Syracuse possession, knocking down a three, his first points of the game, followed by a three by Dolezaj. 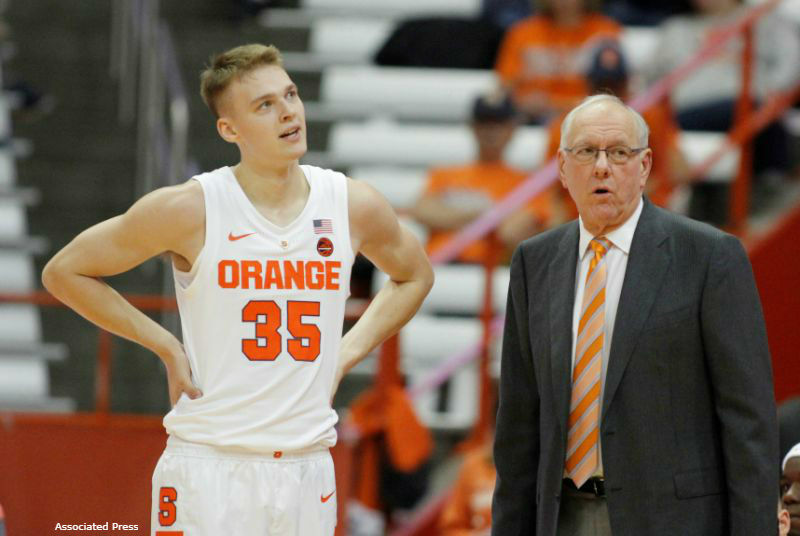 Later on in the first half, Boeheim would account for eight straight points scored by the Orange, making two free throws followed by two shots from beyond the arc, giving the Orange a 30-21 advantage. He would end the first half with 11 points. Sophomore forward Oshae Brissett would give Syracuse their first double-digit lead of the contest, at 31-21, resulting from a 1-for-2 trip to the line. At the half, the Orange led the Eagles 31-24. Boston College was the first to score coming out of the break, with Popovic making both of his freebies, making it a two-possession game, 31-26. Hughes would account for Syracuse's first field goal and points of the second half, going to the rim for two at the 18:51 mark. Senior point guard Frank Howard would follow with his first points of the match-up, a three that would roll the Orange back out to a double-digit lead, at 36-26. At the 14:06 mark of the second half, Boeheim had achieved a new single-game, career-high in scoring, with 14 points, out-doing his previous high of 13 points. He rose to 14 points on a three in the second half, after scoring his 11 aforementioned points in the first half of play. Boeheim's original single-game, career-high of 13 points was accumulated at home versus the PIttsburgh Panthers and on the road against the Boston College Eagles, giving him his best and second-best totals both versus Boston College. It was a 10-point game again at 47-37 after the three in the corner from Bowman, but Battle quickly answered by attacking the rim and completing the old-fashioned three-point play to elevate the Orange up to a 50-37 lead. Battle and Brissett would combine to account for 17 straight Syracuse points that would bring the Orange out to a 20-point advantage, 60-40, with 7:58 to play. True freshman point guard Jalen Carey would check in at the 7:58 mark with the Orange ahead by 20. In one minute and 42 seconds of play, he amounted one turnover and no other stats. Boston College would go on a 14-0 run, with four total players accumulating points, bringing the Syracuse 20-point lead down to six, 60-54, with 3:54 to play. The Orange would end their scoring drought when Battle went 1-for-2 at the charity stripe at the 3:39 mark, giving Syracuse their first points in almost five minutes. Boeheim got the Orange back to a double-digit lead, at 67-56, when he made both of his attempts from the line, at the 1:17 mark. His new single-career high rose to 16 points after these free throws. Syracuse did not make a field goal from the 8:14 on, with their final seven points coming at the charity stripe. They would hold on for the win, 67-56. Battle would lead all in Orange with 21, followed by Boeheim's career-high of 16, and Brissett's 12. Boyman would equal Battle, leading the Eagles with 21, followed by Chatman's 12, and Popovic's 10. Syracuse improved to 17-7 on the season, 8-3 in the Atlantic Coast Conference (ACC). Boston College moved down to .500, with an 11-11 overall record, and is now 2-8 in the ACC. Syracuse now leads the all-time series 49-26 over Boston College, including two wins in Atlantic Coast Conference (ACC) regualr-season play here in the 2018-19 campaign. Florida State struck first, with a three on their first possession coming from sophomore guard M.J. Walker. Walker would connect on another three shortly after to break a 3-3 tie that was created from a three by Syracuse redshirt-junior guard/forward Elijah Hughes on the team's second possession. Down 6-3, the Orange heard from junior shooting guard Tyus Battle who made two jumpers to get Syracuse out ahead for the first time in the contest, 7-6. But their lead was short-lived as the Seminoles went on a shooting spree that led to an 13-2 run, which moved the Seminoles back in front, at 19-9, the first double-digit advantage by either team in the game. During this run, Florida State was 5-for-6 from the field, including three made three-pointers in succession. The Seminoles would begin the match-up 6-for-8 from beyond the arc, getting out to a 26-10 advantage before the nine-minute mark. True freshman point guard Jalen Carey, who had been held out of multiple games, came in at the 8:43 mark of the first half and lost the handle on the ball shortly after, turning the ball over. Two consecutive buckets by Battle got the Orange halfway to the Seminoles, down 36-18. Sophomore forward Oshae Brissett would muscle up a tough shot at the rim right after and connect on the old-fashined three-point play to lower the Florida State advantage to 15, 36-21. The Orange would follow being ahead 7-6 by being on the wrong side of a 27-7 run. Syracuse would respond, however, with a run of their own, 12-3, which brought their deficit to 10, 36-26. The run by the Orange would ultimately be 17-6 before the half, getting Syracuse within single digits at the break, down 39-31. Syracuse fought from down by as many as 22 to within eight at the half. Syracuse would begin the second half by being the first to score, with Brissett connecting on a straight-on jumper on the team's second possession of the second half, within the first minute, bringing the Orange to within two possessions, down 39-33. An old-fashioned three-point play by Oshae followed by a three and lay-in by Battle had Syracuse within four, 42-38. Inside the 15-minute mark, Hughes made his third deep ball of the game, getting the Orange to within three, 46-43. Brissett was at it again underneath, grabbing an offensive rebound off of the miss by Battle, and putting it back up, moving Syracuse to down by a mere point, 46-45. Redshirt-senior forward Phil Cofer would respond immediately for Florida State, and when Syracuse got within two shortly after, 51-49, it was senior guard Terance Mann who had an immediate bucket, as the Seminoles worked to keep the lead that they had had since the 15:31 mark of the first half off of a dunk by Cofer. Hughes would be fouled in the process of attempting a three and would knock down all three of his freebies to bring the Orange once again within one possession, down 55-52. Add in another immediate response when redshirt-sophomore forward Mfiondu Kabengele grabbed an offensive rebound and placed the ball in following Hughes' three free throws and the Seminoles were back ahead by two possessions. On the very next Syracuse possession, junior guard Trent Forrest would steal it away from Hughes and Mann would throw down a soft slam, followed by a shot from beyond the arc by Kabengale and Florida State had once again extended out to a double-digit advantage, 62-52, giving Florida State three straight buckets on three straight possessions. The Seminoles would ultimately score on six straight possessions, moving upward to a 69-56 advantage. Mann would literally rock the rim on a dunk that made it 71-57 followed by an old-fashioned three-point play by Mann that gave Florida State a 73-60 lead. After Syracuse began the second half on an 18-12 run, Florida State responded with an even larger run, 29-13, to close out the contest with an 80-62 victory. The win moves the Seminoles to 17-5 overall and a winning record in the Atlantic Coast Conference (ACC), at 5-4. Conversely, the Orange roll down to 16-7 overall and 7-3 in the ACC. Battle led all scorers on both teams with 23 points, going 8-for-15 from the field. Mann ended atop all Florida State players with 22 points, making eight of his nine attempts in the game. The Orange took their first lead of the game just inside 5:20 before the break on a three from Boeheim that made it 23-22 Syracuse. Miami would respond instantly and there would be two lead changes to follow before Syracuse took the lead for the remainder of the first half when redshirt-junior guard/forward Elijah Hughes connected from long range at the 4:39 mark to bring the score to 26-24 Syracuse. Hughes and sophomore forward Oshae Brissett would swat a pair of shot attempts away on the same defensive stance, but the Orange would allow an offensive rebound that led to points, making it 31-27 Orange. Boeheim knocked down three shots from beyond the arc in total from the 6:34 mark of the first half, going 3-for-5 from deep to go with one free throw, placing him in double-digits at the break, with 10 points. The Hurricanes began the second half 4-for-6 from the field, closing in to within three of the Orange, 42-39, at the 15:09 mark. Senior center Ebuka Izundu's dunk brought Miami to this score, preceded by junior guard D.J. Vasiljevic's 2-for-3 run from long distance. Junior shooting guard Tyus Battle would accumulate his first points of the game at the 17-minute mark of the second half off of a three-pointer after going scoreless in the first half. 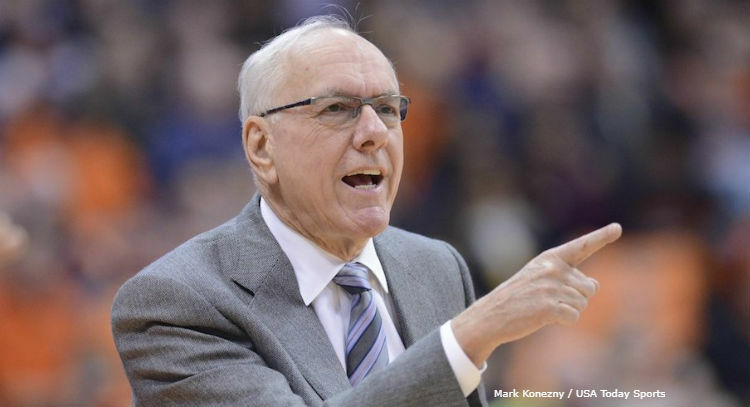 Senior center Paschal Chukwu would block away two consecutive Hurricane possessions and as a result of a technical foul on Hurricanes' head coach Jim Larranaga, Battle cashed in from the charity stripe to give Syracuse their first double-digit lead of the game, 52-41. Redshirt-senior guard Zach Johnson would be met by an opposite and stronger force when he tried to throw down in transition, with Hughes silencing the attempt on a clean swat. With 8:06 left on the game clock, Hughes knocked down his sixth three of the game, making him 6-for-9 from beyond the arc, giving Syracuse a 61-44 advantage. This deep make followed another block by Chukwu on the defensive end. With over six minutes to play in the contest, the Orange had nine blocks. Syracuse would make 14 three-pointers in this game as a team. They were 14-for-30 (46.7%). Hughes led the way with 22 points as the Orange rolled over the Hurricanes by 20, 73-53. Boeheim ended in double-digits in scoring for the second game in a row, attaining 12 points in this match-up to follow his single-game, career-high 13 points at home in a win over the Pittsburgh Panthers a game ago. Battle was the third Syracuse player to amount double-figures, concluding the contest with 10, to go with his nine assists. Syracuse would end the game with 11 blocks, while Miami would not amount a single swat in the entire 40 minutes of play. Vasiljevic was the lone Hurricane in double-figures, accumulating 11 points on the night. With the win, Syracuse improves to 5-1 in conference play inside the Atlantic Coast Conference (ACC), and moves to 14-5 overall. Miami, conversely, fell to 1-5 in ACC play, moving to 9-9 on the season. The Orange have now won three straight games, and seven of their last eight overall. 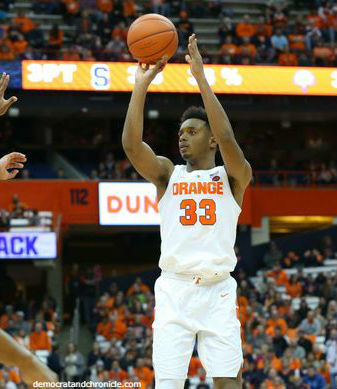 It took the Orange just 12 seconds into the game to score when redshirt-junior guard/forward Elijah Hughes launched from outside for three to make it 3-0 Syracuse at the 19:48 mark. Pittsburgh sophomore forward/center Terrell Brown would respond immediately with a three of his own to tie the game. A layup by sophomore forward Oshae Brissett would move the lead back to the Orange, at 5-3. Syracuse would hold the lead for three minutes and 49 seconds until freshman guard Xavier Johnson's three that made it 8-7 Pittsburgh at the 15:06 mark. Thanks to five straight points from Brissett, the Orange took the lead back at 12-11 at the 12:46 mark of the first half. Syracuse would go on an 11-0 run before a putback at the rim by Pittsburgh that brought the game to 18-13 Orange. Coming off of the bench, true freshman and son of head coach Jim Boeheim, Buddy Boeheim, would knock down both of his beyond-the-arc tries. Junior shooting guard Tyus Battle's five points of the first half would come back-to-back with a three followed by a deep two from straight on which game the Orange their first double-digit lead of the game, at 26-15. All of Battle's seven first-half points would come inside 5:05 before the break. A blunder by senior center Paschal Chukwu would be followed by a 5-0 run by the Panthers that made it 28-24 Orange. It began when Brissett swatted away an attempt by Pittsburgh and Syracuse senior center Paschal Chukwu got the rebound on the defensive end. In the corner still on the Panthers' end, Chukwu did not pass off to teammates nearby, but instead through across court. The pass was intercepted by Pittsburgh senior guard/forward Jared Wilson-Frame who knocked down a three. Xavier Johnson would make the layup that followed. At the break, the Orange led by a mere possession, 28-25. In the first half, Syracuse shot 6-for-11 from three-point range (54.5%). The Orange would open up the second half not scoring until the 16:03 mark, but they still had the lead, with a three from Hughes moving them out to a 31-27 advantage. Battle's first points of the second half come right by the 14:30 mark from a jumper in the lane, making it 36-27 Syracuse. A layup by Battle would come shortly after followed by Battle feeding Chukwu for a wide open dunk to bring the score to 40-27 Orange. The throwdown by Chukwu would have a baseline, one-handed slam from Hughes coming on its heels. With 11:12 to go in the second half, Battle had already equaled his first-half scoring, with seven points, after a three that extended the Orange out to a 45-30 lead. Battle surpassed his first-half scoring when he cashed in from long range and then stole the ball and skied for a one-handed dunk right after, giving him 12 points at this time in the second half. His 19 total points were registered with Syracuse ahead 19, 50-31, in the game. Sophomore forward Marek Dolezaj would take the ball on the baseline, fake a shot, and dribble down toward the basket, timing his shot, and making it off the glass to put the Orange ahead 52-35 with 8:32 to go. With 7:41 to play, Syracuse had gotten out to a 20-point advantage, 59-39, thanks to Buddy Boeheim's third three of the game, on his third try, giving him nine points in 12 minutes on 3-for-3 shooting. The Panthers would go on a 10-0 run from there, however, to shrink the Orange lead to 59-49. Brissett would look to take some of that Pittsburgh momentum away when he dunked home his attempt at the rim with a body on him to give Syracuse a 61-49 advantage. Buddy Boeheim would make his fourth three of the contest immediately after to move the Orange up to a 64-49 lead with 4:31 to play. He would miss his following attempt, giving Boeheim a 4-for-5 outing from beyond the arc. With the Panthers threatening once again within 10, Dolezaj would see a cutting Battle and send the ball from the top of the key inside, with Battle finishing at the rim, giving Dolezaj his fifth assist of the game and Syracuse a 67-55 lead. At the 1:14 mark of the second half, Pittsburgh was back within 10 points after freshman guard Au'Diese Toney stole the ball from Brissett and laid it in, making it 67-57 Syracuse. Despite missing 11 free throws as a team, the Orange would go 7-for-8 from about a minute to play, winning 74-63 over the rival Panthers, their 69th all-time win over the Panthers. Speaking of fouls, Battle played the final 4:06 with four fouls, never fouling out of the game. With the victory, Syracuse is now 13-5 on the season and 4-1 in Atlantic Coast Conference (ACC) play. Pittsburgh falls to 12-6 overall and 2-3 in the ACC. Wilson-Frame and Xavier Johnson were the two Panthers to finish in double-figures, with 19 and 17, respectively. Battle led all Orange and all teams overall with 22, followed on the Syracuse roster by Boeheim with 13 and Brissett with 11. The 13 points scored by Buddy Boeheim are a single-game personal career high. The Orange finished the game 46.3% from the field, including a 46.2% performance from three-point range, making 12 of their 26 tries. But Clemson would respond immediately with a three to take their first lead of the game, 3-2. The Tigers would go on a 5-0 run out to a 5-2 lead, but sophomore forward Marek Dolezaj would knock down a three to tie the game at 5-5. Sophomore center Bourama Sidibe would make up for a turnover by Battle when he blocked Clemson's try at the other end. That block would lead to an Orange possession that concluded with redshirt-junior guard/forward Elijah Hughes getting a tough two at the rim to give Syracuse their second lead of the game, at 7-5. After helping to get the Orange two, Sidibe would get two of his own when he fought in the paint and elevated up. Dolezaj would impress offensively once again when he almost lost the ball but stayed with it, went toward the basket, and rose up for a one-handed jumper that would give the Orange a 17-9 advantage. Syracuse attained their first double-digit lead of the game when true freshman point guard Jalen Carey fed sophomore forward Oshae Brissett who ran over to bail him out; Brissett's tough take under the basket made it 19-9 Orange. Clemson, down by as many as 12 in the first half, would get within two possessions, down six, with 4:27 to play, 23-17, thanks to a 6-0 run. That run was broken by Howard's jumper, but a three by sophomore forward Aamir Simms right after would get the Tigers to a five-point deficit, 25-20. Two physical plays made back-to-back by Brissett and then Battle extended the Orange out to a nine-point advantage, 29-20, with about two minutes before the break. The make by Battle was a one-handed jumper from the baseline that fell through the nylon. Syracuse would take a 30-22 lead into halftime, shooting 50% from the field (13-for-26) while Clemson made 32% of their first-half tries (8-for-25). Neither team shot well from behind the arc in the first 20 minutes of play: Syracuse was 3-for-14 (21.4%) and Clemson was 2-for-8 (25%). The Orange had no offensive rebounds in the first half until Dolezaj pulled one down with 26 seconds before the break. The first two points of the second half went to the same team as in the first, when Hughes made both free throws by the 19-minute mark to get the Orange back to a double-digit advantage, 32-22. Senior point guard Frank Howard would obtain the first made field goal by either team in the second half when he connected on a baseline jumper at the 18:40 mark, bringing the score to 34-22 Orange. Two made three's early in the second half shrunk Syracuse's lead to two possessions, 34-28, with 16:11 to play. Sophomore guard Clyde Trapp and gradduate guard Marcquise Reed accounted for the deep makes. Dolezaj, however, would elevate the Orange back to a double-digit lead with his second three of the game, this from straight on, to give Syracuse a 38-28 advantage, making him 3-for-5 from the field and 2-for-4 from long range. With eight points, four assists, three rebounds, two steals, one block, and no turnovers in 25 minutes, Dolezaj was met with a round of applause and cheers from the fans as well as his coaches and teammates standing to greet him at the bench when he took a breather with 13:01 to play. Clemson would match Syracuse 11 to 11 in points to bring the score to 54-43 Orange before Reed would's jumper in the paint lowered the Tigers' deficit back down to single-digtis, 54-45. With the inclusion of the following three, Reed scored seven straight points for Clemson, making it a two-possession game at 54-48 Syracuse. In three minutes and change, starting at the 7:10 mark of the second half, the Orange had four turnovers, only taking two shots, and missing them both, in that span of time. There was a span of five minutes and 21 seconds between Syracuse field goals, with Brissett's jumper at the 2:39 mark of the second half being the first made field goal for the Orange since Howard's jumper at the 8:16 mark. With 1:11 to play, Clemson had fought to a 58-51 deficit, shooting 10-for-26 to get there, while Syracuse went 7-for-21 in the second half with a little over a minute to go. A flagrant 1 was called on Reed with 1:01 to play, resulting in the Tigers' leading scorer fouling out; he had 16 points in 37 minutes. Howard would make both free throws coming from the flagrant on Reed and garduate guard Shelton Mitchell would account for the final field goal of the game with 20 seconds left, bringing the end score to 61-53, advantage Orange. With the victory, Syracuse improved to 2-0 in the Atlantic Coast Conference (ACC), while Clemson went the opposite way, falling to 0-2 in conference play. The Orange played eight, and six of them scored with Hughes leading the way, amounting 14, followed by Howard and Battle each with 12, Dolezaj with 10, Brissett with nine, and Sidibe with four. 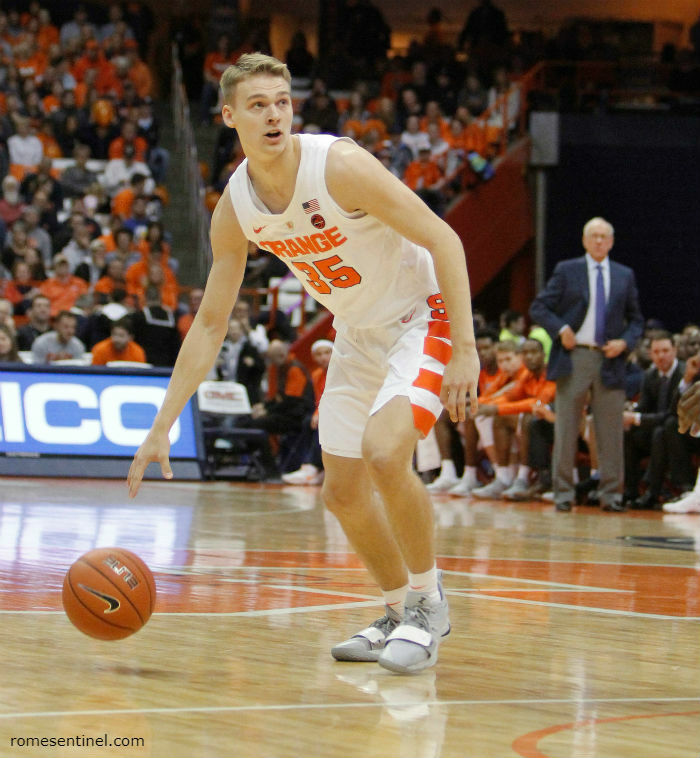 Carey and fellow freshman guard Buddy Boeheim ended scoreless on the night. Dolezaj would end with 10 points, four rebounds, four assists, two steals, two blocks, and no turnovers in 30 minutes of action. Syracuse and Clemson both came in 10-4, with the Orange elevating to 11-4 and the Tigers moving to 10-5.